I'll be back to generating a regular blog post/essay next week when I return from my travels. Meanwhile, thanks very much to all of you who are participating in these events!! 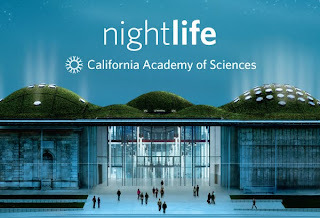 Note: Promotional image for Night Life at the Cal Academy in San Francisco, property of the California Academy of Sciences. Most posts on The Whirlpool of Life deal with weighty issues like mass extinction, sustainability, and shifting worldviews. Today’s offering stands in stark contrast, yet it addresses a question that I am asked frequently. How do paleontologists go about naming dinosaurs and other extinct creatures? 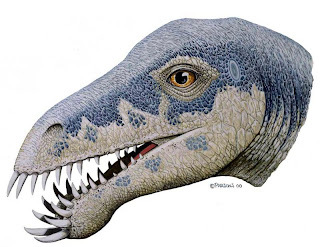 The trigger for this discussion is yesterday’s announcement of a new dinosaur, Seitaad reussi, from the high desert of southern Utah. Seitaad’s world debut was made in conjunction with publication of a paper in the online, open-access journal PLoS ONE describing this new Jurassic-aged beast (1). 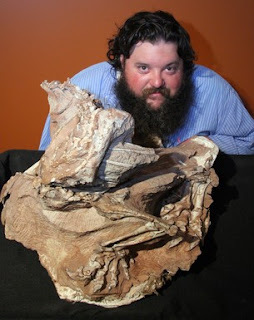 The exquisitely preserved partial skeleton was collected several years ago near Bluff, Utah, by the paleontology team from the Utah Museum of Natural History, where I am a research curator. The two authors of the study, Joe Sertich and Mark Loewen, are ex-students of mine (Sertich is now a doctoral candidate at Stony Brook University, and Loewen is now an instructor at the University of Utah). 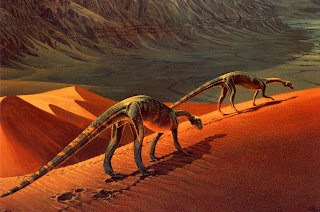 Seitaad is (or, more precisely, was) a prosauropod dinosaur: a mid-sized, long-necked, small-headed, two-legged herbivore that was a locomotory switch-hitter—capable of walking on two or four legs. 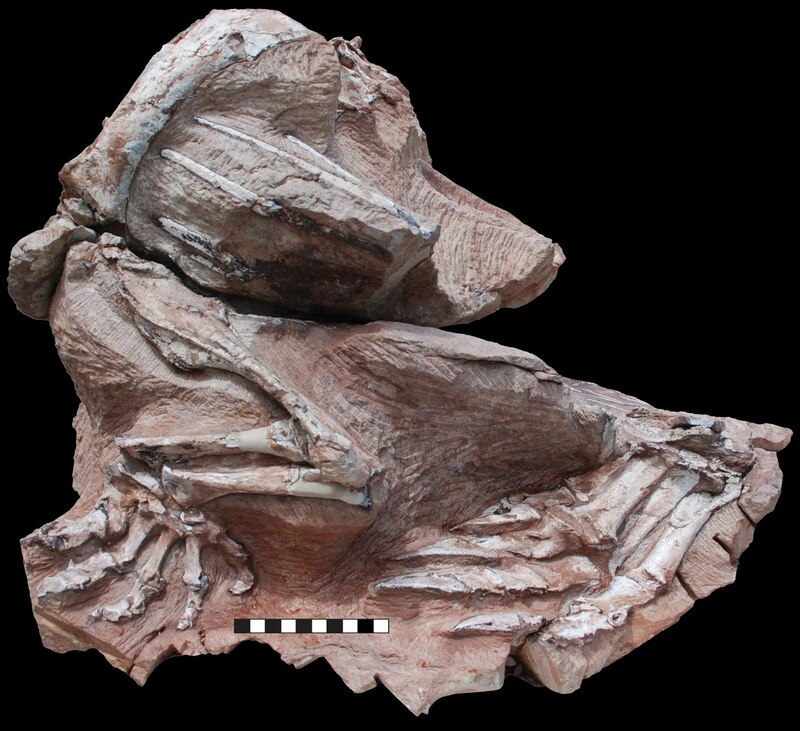 It belonged to the first major radiation of dinosaurs (formally referred to as basal sauropodomorphs) that swept across much of the supercontinent Pangaea during the Late Triassic and Early Triassic. Seitaad lived in an arid desert setting, and the only known individual apparently experienced a premature demise in a dune collapse. Although small as dinosaurs go (~10-15 feet long; 150-200 lbs), this prosauropod may well have been the largest herbivore in its habitat, with titanic relatives like Brachiosaurus and Diplodocus still millions of years away. I greatly enjoyed Mark and Joe’s excellent study of this ancient desert denizen. I also enjoyed their choice of moniker, which is both interesting and pretty typical of the process that paleontologists (and biologists generally) go through in naming newly discovered animals. The first part of the name, Seitaad, refers to a mythological sand-desert monster from Navajo (Diné) lore, simultaneously honoring the local indigenous peoples and the name of the rock unit entombing the specimen (the Navajo Sandstone). The latter part of the name, reussi, derives from Everett Ruess, a famous young explorer, poet, artist, and historian who mysteriously disappeared in the southern Utah desert in 1934. So here’s the deal. You can name a dinosaur, or any other newly discovered organism, after a place, a time, a person, some particular feature of the creature in question, or just about anything at all, as long as the name has not been used previously. One caveat. It’s regarded as highly uncouth (and, for all I know, against the rules) to name a new species after oneself. With that single exception, however, the honoree may be real or fictitious, human or nonhuman. Once the subject(s) of the name is (are) chosen, you must then follow a formal (though not cumbersome) set of do’s and don’ts dictated by International Code of Zoological Nomenclature. The two-part name—for example, Seitaad ruessi, Tyrannosaurus rex, or Homo sapiens—is a biological standard set in the 18th Century by the famed Swedish biologist Carolus Linnaeus, and still used to this day. The first part of the name is called the “genus,” whereas the latter is the “species.” The genus-species duo represents a hierarchy, with the genus being the more inclusive category. So a single genus often contains multiple species (e.g., Homo sapiens, Homo erectus, Homo ergaster, etc.). Mark and Joe are certainly not the only paleontologists with a penchant for mythology. If one looks solely among dinosaurs beginning with letter “A,” examples include: Achillobatar (named for the mythical hero Achilles), Aeolosaurus (named after the Greek god of winds), and Atlasaurus (for Atlas, a giant who, in Greek mythology, held up the heavens). In 1995, I added another to the bunch (2)—Achelousaurus, a ceratopsian (horned) dinosaur named after Achelous, a mythological river god of the ancient Greeks who was capable o f shape-shifting. In order to fight Heracles (Hercules of Roman mythology) over (what else) a woman, Achelous changed himself into a bull. Heracles won the battle when he ripped off the horns of the bull. The name fits because Achelousaurus was a hornless ceratopsian dinosaur that evolved from horned ancestors. Many, many more mythological creatures can be found embodied in the names of dinosaurs. Just as mythology is one common theme used for naming dinosaurs and other animals, famous characters are another. Indeed fame seems to be a regular attractor for scientists naming new critters, whether the honoree is real or fictitious. As noted, Seitaad’s second name refers to legendary adventurer Everett Ruess. Extending the scope beyond dinosaurs, we might cite the wasp named Mozartella beethoveni, the snake Montypythonoides, the trilobite Mildesdavis, the crustacean Godzillus, or the diminutive midge Dicrotenipes thanatogratus (“thanatos” is Greek for “dead” and “gratus” is Latin for grateful, in honor of the Grateful Dead). Another of my favorites is a fossil turtle dubbed Ninjemys, after the cartoon Teenage Mutant Ninja Turtles. Why Mark Knopfler? Well, way back in the mid 1990’s, when there were still cassette tapes and Sony Walkmans (remember those? ), one of the crew members brought a pair of small speakers along with her tape player. Among the bands featured on the quarry playlist that summer was Dire Straits, a particular favorite of expedition leader David Krause. As serendipity would have it, when we played Knopfler’s music, we tended to find more fossils of the new little meat-eater, whereas these bones were few and far between when the music wasn’t playing. Back in camp one night, my longtime friend and colleague Cathy Forster (George Washington University) suggested that we name this new dinosaur after our musical talisman, Mark Knopfler. For some reason, the consensus among crewmembers (perhaps influenced by beer consumption) was enthusiastic support for the idea. So that’s my two bits on names. Hearty congratulations to Joe Sertich and Mark Loewen on their big announcement. Oh, and keep your eyes open for more announcements of new Utah dinosaurs in the near future . . .
2. Sampson, S. D. 1995. Two new horned dinosaurs from the Upper Cretaceous Two Medicine Formation of Montana, USA, with a phylogenetic analysis of the Centrosaurinae (Ornithischia: Ceratopsidae). Journal of Vertebrate Paleontology, 15(4): 743-760. 3. Sampson, S. D., Carrano, M. T., Forster, C. A. 2001. 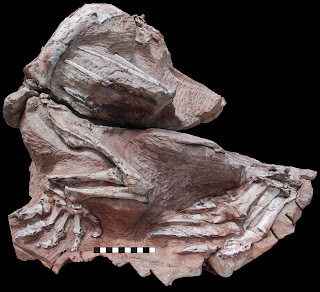 A bizarre predatory dinosaur from Madagascar: implications for the evolution of Gondwanan theropods. Nature, 409: 504-505. 1. The partial skeleton of Seitaad reussi, which preserves the central portion of the body. 2. The skeletal reconstruction of Seitaad reussi, with the preserved elements highlighted. 3. Joe Sertich with Seitaad reussi specimen. 4. 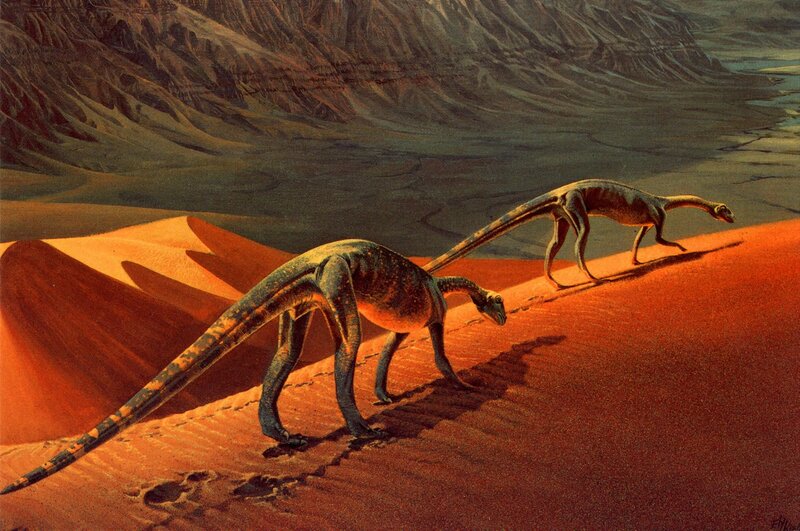 Prosauropod dinosaurs in desert setting. Painting by Eleanor Kish. 5. 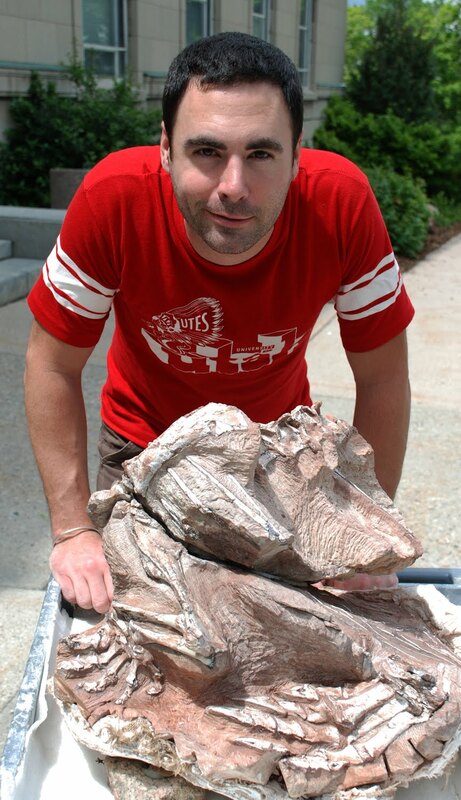 Mark Loewen with Seitaad reussi specimen. 6. Masiakasaurus knopfleri, the buck-toothed predator from Madagascar. Artwork by Bill Parsons. A radical notion with deep implications for our understanding of the universe is now percolating within scientific circles—nature flows downhill. You may recall learning about the second law of thermodynamics, the unwavering propensity of energy to disperse and, in doing so, transition from high quality to low quality forms—“increasing entropy,” to use the physicists' preferred term. High quality in this case refers to energy that can be put to use for a variety of purposes, whereas low quality energy generally refers to heat. Ecologist Eric Schneider (1) expresses the second law a little differently, arguing that "nature abhors a gradient," where a gradient is simply a difference over a distance—for example, in temperature or pressure. It helps me to think of this trend toward reducing gradients as nature flowing downhill. That is, if we think of a gradient as a more of something on one side and less of it on the other side, stuff tends to slide downhill from the more-side to the less-side. In nature, open physical systems—including those of the atmosphere, hydrosphere, and geosphere—embody this law, being driven by the dispersal of energy, and particularly the flow of heat, “downhill” in the direction of some equilibrium state. 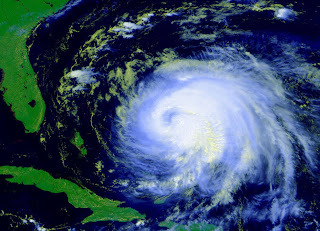 Phenomena as diverse as the motions of lithospheric plates, the northward flow of the Gulf Stream, and occurrence of deadly hurricanes are all examples of this process at work. Growing evidence suggests that life is no different. It’s often been said the life's complexity contravenes the second law (since organization is the opposite of chaos or entropy), indicating the work either of a deity or some unknown natural process, depending on one's bias. Yet the evolution of life and the dynamics of ecosystems strictly obey the second law, continually dissipating low quality energy. 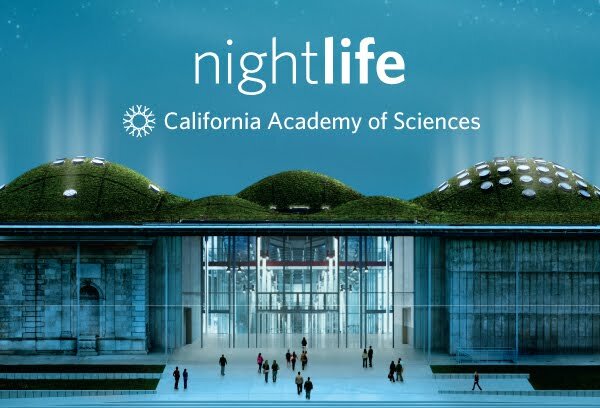 Living systems carry out the task not by burning brightly and disappearing, like a forest fire, but through stable metabolic cycles that store chemical energy and continually reduce the solar gradient (that is, the difference in available energy between the sun and the Earth). Photosynthetic plants, bacteria, and algae capture energy from the sun and form the core of all food webs. So virtually all organisms, including us, are made of sunlight—temporary waypoints in the flow of energy. As energy goes from plants to herbivores, around 90% is lost to heat. 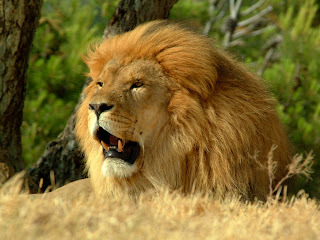 This rampant dispersal of energy continues up the food chain when herbivores are consumed by carnivores, and again when carnivores fall prey to other carnivores. As a result , meat-eaters like orcas and lions must subsist on about 0.00001% (one hundred thousandth of one percent) of the energy originally captured by plants. This precipitous trend toward diminishing returns explains why ecosystems tend to have many more plants than herbivores, and many more herbivores than carnivores. From the point of view of the food web, life appears extremely inefficient in delivering energy. But if the goal is to disperse energy, life is phenomenally successful. Moving from ecology to evolution, life has become increasingly complex over the past 3.5 billion years, evolving from microscopic single-celled bacteria to macroscopic multicellular organisms of stunning diversity. Accompanying this bewildering increase in diversity has been a corresponding increase in biomass (the mass of living organisms). This dramatic transformation is not due simply to natural selection, as most evolutionists still argue, but also to nature's "efforts" to grab more and more of the sun's flow. The slow burn that characterizes life’s metabolism enables ecological systems to persist over deep time, changing in response to external and internal shake-ups. Ecology has been summarized by the pithy statement, "energy flows, matter cycles." Yet this maxim applies equally to complex systems in the non-living world; indeed it literally unites the biosphere with the physical realm. More and more, it appears that complex, cycling, swirling systems of matter have a natural tendency to emerge in the face of energy gradients. This recurrent phenomenon may even have been the driving force behind life's origins. (For those interesting in the origin of life, I strongly recommend the following video ). This idea that nature flows downhill is not new, and is certainly not mine. Nobel laureate Erwin Schrödinger was one of the first to articulate the hypothesis, as part of his famous "What is Life" lectures in Dublin in 1943 (3). More recently, Jeffrey Wicken (4), Harold Morowitz (5), Eric Schneider and others have taken this concept considerably further, buoyed by results from a range of studies, particularly within ecology. Schneider and Dorian Sagan provide an excellent summary of this hypothesis in their book, "Into the Cool" (1). The concept of life as energy flow, once fully digested, is profound. 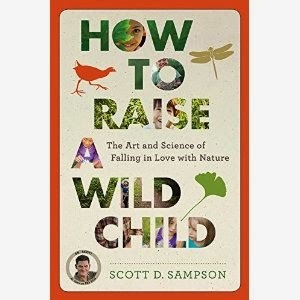 Just as Darwin fundamentally connected humans to the non-human world, a thermodynamic perspective connects life inextricably to the non-living world. This radical idea, once broadly distributed and understood, is likely to provoke reaction from many sectors, including religion and science. The wondrous diversity and complexity of life through time, far from being the product of intelligent design, is a natural phenomenon intimately linked to the physical realm of energy flow. Contrary to the current consensus among biologists, evolution is not driven by the machinations of selfish genes propagating themselves through countless millennia. Instead, ecology and evolution operate in tandem as a highly successful, extremely persistent means of reducing the gradient generated by our nearest star. In my view, evolutionary theory (the process, not the fact of evolution!) 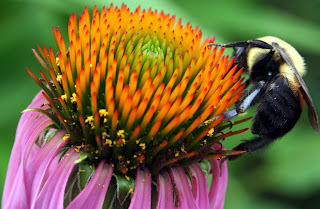 and biology generally are headed for a major overhaul once investigators fully comprehend the notion that the complex systems of earth, air, water, and life are not only interconnected, but interdependent, cycling matter in order to maintain the flow of energy. 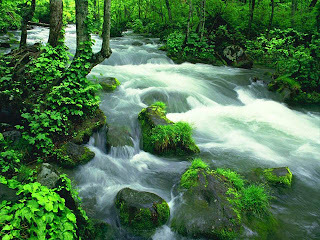 Nature—living and nonliving—flows downhill. Outside the halls of science, seeing ourselves as inextricably embedded in these flows of matter and energy has great potential to help us reconnect to nature. Currently, we tend to view humanity as somehow apart from (and above) “nature.” Many commentators on sustainability (including myself) talk about our “relationship with nature.” But in many respects this is a twisted notion. We may as well speak of the human relationship with humanity, since we are part of nature in exactly the same way that we are part of humanity. Recognizing our bonds not just to other life forms but to the nonliving aspects of nature can go a long way toward bridging the human-nature divide. 1) Schneider, E. D. and D. Sagan. 2006. Into the Cool: Energy Flow, Thermodynamics, and Life. University of Chicago Press, Chicago. 3) Schrödinger, E. 1944. What is Life: The Physical Aspect of the Living Cell. Cambridge University Press, Cambridge. 4) Wicken, J. 1987. Evolution, Thermodynamics, and Information: Extending the Darwinian Program. Oxford University Press, New York. 5) Morowitz, H. J. 2002. The Emergence of Everything: How the World Became Complex. Oxford University Press, New York. Evolution & Climate: An Unholy Matrimony? 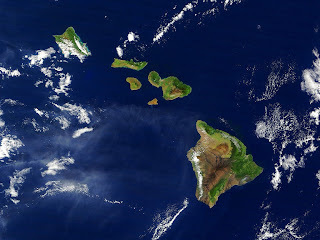 Last week, a New York Times article by Leslie Kaufman (1) highlighted an alarming new trend: the recurrent pairing of evolution with global warming by conservatives. On the face of it, this marriage seems odd and unexpected; the former relates to the turnover of life through billions of years of deep time, whereas the latter labels a decades-old trend toward atmospheric heating. What do these disparate notions have in common? Both tend to make conservatives—and particularly religious fundamentalist conservatives—very nervous. Evolution, of course, raises fundamentalist ire because it portrays an entirely different story of our origins than does the bible. Concerns about human-induced global warming are a little tougher to pin down. Rev. 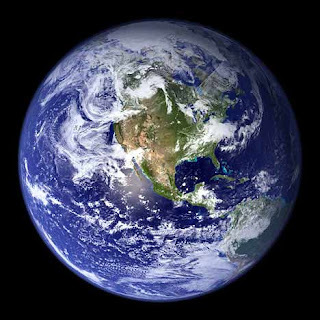 Jim Ball of the Evangelical Environmental Network is quoted as saying that many global warming deniers consider it “hubris to think that human beings could disrupt something that God created” (1). But a deeper reason is that reducing greenhouse gas emissions threatens continued industrialization, or at least business as usual, and pro-business lobbies are waging a (thus far very successful) campaign to discredit climate science and shift public opinion. Ok, but that still doesn’t explain why links are being forged between biological evolution and atmospheric temperatures. The answer here is education. Over the past century, fundamentalist Christians have adopted a succession of strategies aimed at keeping evolution out of the classroom, or at least have it “balanced” by alternatives (2). Each time, pro-evolution advocates have been able to thwart these efforts. The most recent iteration of this dance centered on “intelligent design,” the proposition that the sheer complexity of life necessitates design by an intelligent being. Once again, the evolutionists prevailed, achieving a resounding victory in Pennsylvania district court in 2005 (2). Unable to inject intelligent design into science classrooms, fundamentalists redoubled their efforts to discredit evolution, pushing the mantra known as “teach the controversy” (i.e., create the illusion of academic controversy and then argue that it must be taught in schools). Advocates with a clear creationist platform attempted to have stickers placed inside biology textbooks prompting students to regard evolution as “just” as theory. Once again, a district court decision—this one in Atlanta in 2005—determined that the stickers violated First Amendment separation of church and state (since evolution alone was the target). Undaunted, anti-evolution fundamentalists have now decided that the recent public angst over global warming can be put to good use. By creating (fictitious) debates among biologists and climate scientists over the veracity of evolution and global warming, respectively, it might be possible to foment doubts in the general public and legislate for more “critical thinking” in schools. Astrophysicist Lawrence Krauss of Arizona State University argues that this strategy may involve even grander aims, “casting doubt on the veracity of science—to say that it is just one view of the world, just another story, no better or more valid than fundamentalism” (1). Legislative bills questioning the science of the Big Bang, evolution, global warming, and/or human cloning have now been introduced in several states, including Kentucky (still pending) and Oklahoma (not enacted). The concern among many scientists and educators is that a few state-level victories linking doubts about global warming and evolution could have a cascading influence on school curricula around the country. Even if the legislative efforts are not successful, the appearance that the science is in question could induce text book writers and teachers to downplay or even avoid these key topics, as it has in the past. Evolution and global warming have two other things in common. Both are founded on in-depth research supported by the vast majority of specialist researchers (within evolutionary biology and climate science, respectively), and both are accepted by less than half of the American public. It’s ironic that a society so utterly dependent on—indeed in love with—technology should question the veracity of big ideas embraced by the same scientific community that generates that technology. The profound disconnect between scientific and public consensus is a critical matter, and bridging this gap deserves our utmost attention. Why should we be concerned about the presence or absence of evolution and global warming in the science classroom? Because literacy in both areas may well be key to sustainability, and thus to the persistence of civilization. Rising global temperatures represent one of the greatest threats we now face. If greenhouse gas emissions continue apace, all major indicators suggest that the resulting increase in sea levels, desertification, habitat losses, and species extinctions will result in untold human suffering (not to mention its impact on nonhuman lifeforms). Whether or not you fully accept that global warming is happening or that humans are the primary cause (there is overwhelming evidence for both), doesn’t it make sense to heed the warnings of the world’s top climate scientists and cut greenhouse gas emissions 80% by 2020? The alternative path is simply too frightening to consider. And if you agree in principle with such a precautionary approach, then it should make equal sense that we promote climate literacy in schools, thereby equipping the next generation with the necessary knowledge to address this global, long term issue. As for evolution, this idea resides at the core of all the life sciences, including such areas as agriculture and medicine on which we all depend. Biology without evolution is like physics without gravity, something to consider next time you board a plane. Today, most of us in Western societies live without any meaningful sense of place or deep time, a disastrous situation for a culture seeking to become sustainable. Expanded to encompass the Great Story of cosmos, life, and culture, evolution supplies an amazing and profound narrative with the potential to embed us back into nature and imbue our lives with deep meaning. Evolution can help reinsert our minds back into the flows of energy and matter that our bodies have never left. But this will happen only if the epic of evolution is taught in schools, where it is all but absent at present. One of the things that most concerns me is the persistent mindset that entrenches science and religion as opposing forces. The ongoing, often venomous battles involve fundamentalists on both sides who seem to think that annihilation of their opponents ideologies must be the goal. Yet the sustainability clock is ticking ever louder, and I find it difficult to envision a solution arriving in time without bridging the science-religion divide and engaging both sides in conversation. Fortunately the vast majority of science and religion practitioners are not fundamentalists, and much room remains for productive discussions that can transcend this debate and identify mutually beneficial solutions. Nevertheless, notwithstanding the need for compassion and compromise, science education should be based on scientific consensus, not on public opinion. Whereas the former is established through the hard-won process of peer review, the latter can be shaped and distorted by disinformation campaigns. With few exceptions, when big ideas change in science, we don’t throw out all the preceding insights; we build on them. Our understanding of evolution will undoubtedly grow by great leaps and bounds in the coming decades, but no grounds exist for suspecting that we will toss out Darwin’s key insights altogether. Similarly, there is virtually no doubt among leading atmospheric scientists that our climate is warming rapidly, or that we need to dramatically reduce our emissions of greenhouse gases if we are to stave off a calamitous future. So presenting the hard science of these ideas in school classrooms is critical to our future. 1. Kaufman, L. 2010. Darwin Foes Add Warming to Targets. New York Times, March 3, 2010. 2.Scott, E. C. 2008. Evolution vs. Creationism: An Introduction, Second Edition. Greenwood, Santa Barbara. A couple of weeks ago while in Orlando, Florida, my family and I paid a visit to Disney World. Not surprisingly, the nagging trepidations I felt leading up to the big day were far outweighed by the all-but-uncontrollable excitement brimming from our seven year-old daughter, Jade. 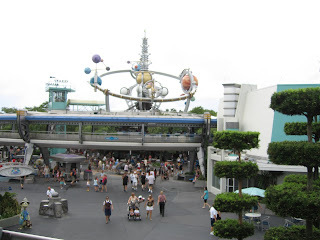 As it happened, we spent much of our day in and around Tomorrowland. 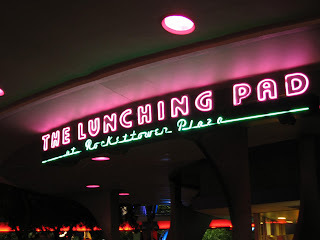 “How bad could it be?,” I thought as we walked past Cosmic Ray’s Starlight Cafe. After all, I’m interested in the future. Over the next couple of hours, our futuristic adventures included Buzz Lightyear’s Space Ranger Spin, where we were invited to blast aliens allied with the evil Emperor Zurg (sworn enemy of the Galactic Alliance). Then there was Stitch’s Great Escape, where we were trained to guard dangerous alien prisoners. Next my wife and I shared our first roller coaster experience, zooming through the darkness down Space Mountain. I was particularly intrigued to experience Walt Disney’s Carousel of Progress, which blends nostalgia and futurism to show the story of a “typical” American family (read white and affluent here). Walt Disney was a futurist of sorts, and a big believer in the power of technology. 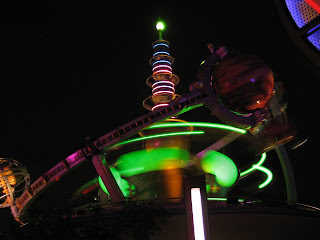 Munching on popcorn as we exited the park at dusk, I found myself reflecting on the futuristic vision of Tomorrowland—and becoming increasingly bothered. Now I realize that a kid-oriented theme park is not the first place one should seek out wise prognostications. Nevertheless, it seems likely that this wildly popular 21st Century cultural attraction conveys elements of the vision broadly held by Western societies. 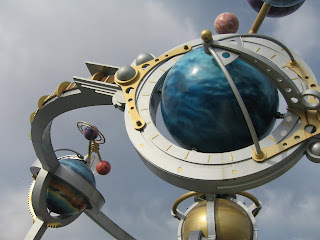 In particular, I think that Tomorrowland embodies three implicit—and, to my mind, disturbing—assumptions. The first is that humans are divorced from nonhuman nature here on Earth. The only nonhuman lifeforms I saw in Disney World’s vision of the future were aliens and an ageing animatronic dog named Rover (in the Carousel). The unstated message is clear; whatever the future holds for us, it need not involve the plethora of nonhuman lifeforms currently living on the planet. I guess Earth-bound species are superfluous if we’re destined to explore the galaxy (“To infinity, and beyond!”). The second assumption is that technology can fix anything. Got a problem? Just apply a little old fashioned human ingenuity and you’ll soon have a microwave oven, containment field, or handheld blaster that provides a solution. The third and closely related assumption is the inevitability of progress. With the ever-accelerating power of technology at our disposal, continual progress—defined mostly in terms of labor-saving devices and rocketships—is our destiny and the future looks ever brighter. Now for the anticipated dose of reality. Contrary to the vision of Tomorrowland, we are inextricably embedded in nature and entirely dependent on its constant supply of air, water, and food. At least for the foreseeable future, we don’t have another planet, let alone a galaxy of planets, to turn to if we mess this one up. So this world must be our priority, and any vision of the future needs to feature a healthy, vibrant Earth. Technology simply is not going to bail us out of all our eco-predicaments—we also need to shift the way we think about the places we live and the other creatures that share these places with us. And finally, material progress cannot continue infinitely on a finite planet. We must rethink the notion of “progress” and redefine it in terms of human health and the health of the planet. At this point, many of you are probably thinking, “Ok, fair enough, but Disney World? Come on. Shouldn’t Disney World just be a place of fun—a wonderworld escape from all the bad news we face daily?” In my opinion, the answer is yes and no. On the one hand, I’m certainly not advocating that Disney incorporate eco-disaster elements like global warming and mass extinction into their parks; fun should definitely be the theme. On the other, even theme parks should be conscious of the implicit messages they convey to both children and adults. The unhappy truth of the matter is that civilization and its supposedly bright future of techno-gadgets and space travel is currently in jeopardy. Arguably the greatest threat is dysfunctional human thinking, including prevalent notions like the human-nature divide, blind faith in technology, and the inevitability of progress. Imagine for a moment if Tomorrowland became a big part of the solution instead of perpetuating the problem. On a larger scale, what might happen if Disney devoted a substantial portion of its mega-power to promoting a sustainable vision? Picture all those amazing, creative minds applying their energies to illustrate new, healthier ways of thinking. Mickey Mouse, Buzz Lightyear, and the Disney princesses could all be enlisted in the cause, helping kids reconnect with the nonhuman world and grow up to be stewards of the planet. Fantasy? Perhaps, but sustainability is going to require not only changes in parenting and education, but also in the bombardment of messages that our children receive daily and hourly through the media. My strong hunch is that the media will not make the necessary changes voluntarily, at least as long as the mantra of materialism remains dominant. But a sufficiently large grassroots movement that set about to change the messages our children receive could not be ignored even by the largest corporations. The first steps in this process are building awareness of the problem and fostering discussion of potential solutions. For starters, think about the messages—explicit and implicit—that you expose yourself (and perhaps your children) to every day. How do these messages constrain the way we view the world and our interaction with it? Now think about changing your behavior so that you and your family receive healthier, more accurate messages that are consistent with our current moment in history. Please understand. I do not mean to disparage all of Disney’s cultural contributions. As a family, we’ve enjoyed many Disney movies, and the Disney theme parks differ from most others in an important commodity—magic. It’s amazing to watch kids stand in awe when meeting Cinderella, or smile uncontrollably upon spotting Mickey Mouse. My wish is that this remarkable sense of magic be linked to the wonder of Earth’s natural bounty to help forge lasting connections between children and nature. Yes, I may be a naïve dreamer, but it’s a dream worthy of our energies.